20 16 has been an exciting and eventful year for MJ Petfoods. With full GMP+ Manufacturer Accreditation in recognition of our stringent quality assurance processes, and the development of our extended storage, handling and processing facilities at Cranswick Mill, MJ Petfoods have become one of the leading and most respected suppliers of innovative quality ingredients to the UK and European Pet Food Industries. 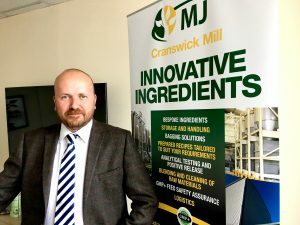 By introducing 3 distinct product lines at our Cranswick Mill facility, we are constantly striving to develop new innovative ways to solve day to day production, storage and raw material issues that the Pet Food Industry experiences. MJ MyHybro, we work closely in Partnership with your Production, R&D, and Technical staff, utilising our onsite facility and expertise to procure the finest quality ingredients and produce consistent, bespoke homogenous blends to your specific recipes, nutritional declarations and recipe batch weights saving you production time, storage facilities and material handling and helping you to increase productivity. MJ Active Extra is designed to stabilise the dry mix and to guard against oxidation throughout your manufacturing process and through the course of your finished products shelf life. MJ Active Extra can be applied as a Micro or Macro addition to suit your recipes and production process. MJ PremPal is an enhanced range of specially selected ingredients that are processed at our bespoke plant in order to clean raw materials, creating what is essentially an animal protein ‘flour’. MJ PremPal provides animal proteins that have a distinct reduction in foreign bodies, bone particles and unwanted hair offering a high quality meal that will improve palatability. These products are proving to be highly successful for producers of treats and baked products both visually in the finished product and with enhanced ‘mouth feel’ and digestibility. We are now the proud owners of our first, brand new, Bulk Blowing Trailer specifically dedicated to Pet Food Ingredients, giving you greater flexibility when receiving your raw materials and ingredients. Working in partnership with a long established and Pet Food Industry experienced haulier, our aim is to be the first, independent, Category 3 Pet Food Logistics Solutions transport company in the industry helping you to meet industry guidelines and requirements and giving you piece of mind that your ingredients are arriving at your production plant in a dedicated and reliable trailer.